Meethi Thepla is very famouse Gujarati snack bread. It is very flavorful and makes for a great travel or picnic food. You can serve with Pickle or with plain yogurt. 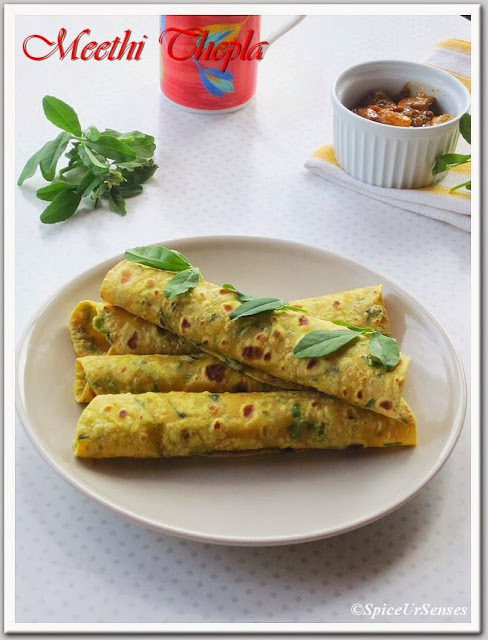 Actually I love most of Gujarati snacks like Dhokla, Thepla, Khahkra and the most favourite of mine is Fafda, I simple love this snacks and can munch any time of the day.. I usually prepare thepla very often for the breakfast, because it is very healthy and easy to cook and easy to eat for the people like my hubby, who is always in a hurry..
You can make them in a bulk and store them for 4 to 5 days and they will taste same... There are many different version to cook, but I follow one very simple recipe sometime I do change ingredients but most of the time it is simple. 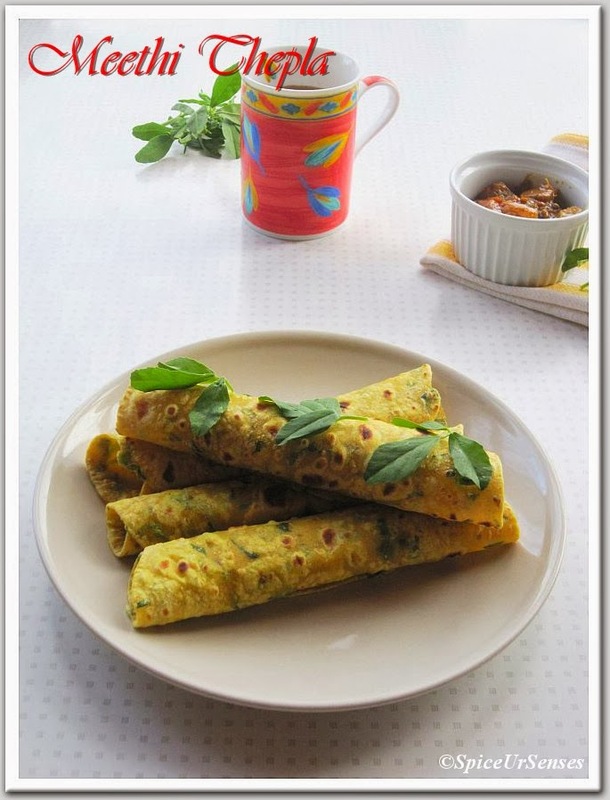 Do try this recipe and serve healthy food to your loved ones..
Chop meethi leaves finely and set it aside. 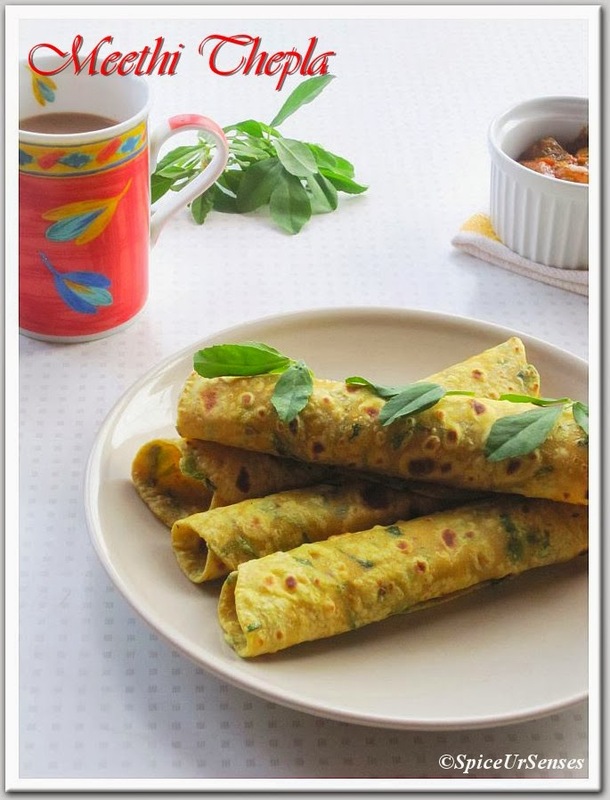 Take a big bowl and add wheat flour and besan along with all the masalas and mix well. Add oil and curd and rub and mix the flour nicely. Now add methi leaves, with little water and knead till the dough is smooth and soft. Grease your hands and knead it again until it gets the elastic texture. cover it and leave it for 10-15 mins. Make medium size balls of the dough and roll it to a disc of 6'' in diameter by dusting it in between with the dry flour. Heat a tawa and place the rolled thepla on the tawa and let it cook slightly on one side. Turn it to the other side and apply oil and then turn it again and apply oi and let it roast on both sides till it forms the brown spots. Prepare all the theplas in the same manner and stack them in a roti basket. Serve the theplas hot/warm/cold with Pickle and yogurt. 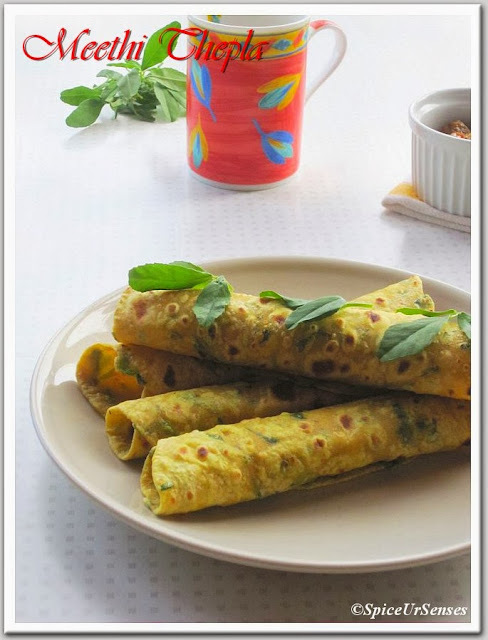 Very flavorful and yummy paratha. Very yummy and interesting Thepla...nice clicks Rumana. Very healthy and yummy thepla. Love the clicks. one of my fav thepla :) perfect to go with onion raita and pickle.. 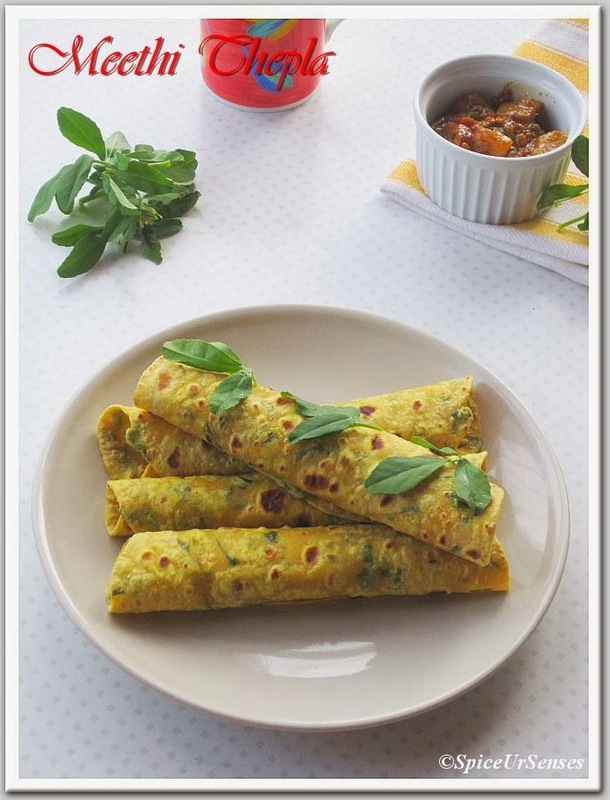 Healthy and delicious thepla.. Neatly presented..
healthy thepla n very neat presentation!!! Wow..looks so inviting and colorful. Very healthy thepla.. love it! !